RIT imaging scientist John Schott is a key figure in the design and deployment of the Landsat series of satellites, the largest source of global remote sensing data. 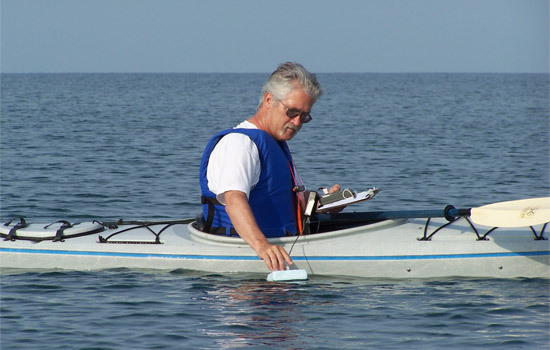 In the above picture, Schott measures water temperature on Lake Erie. Rochester Institute of Technology scientist John Schott has been named to the Landsat Science Team by the U.S. Geological Survey, in cooperation with NASA. Schott joins an expert team of scientists and engineers that will serve five years and provide technical and scientific support of the upcoming Landsat 8 spacecraft to be launched in February 2013. He will give input on issues pertaining to the use of satellite data for monitoring fresh and coastal waters. “We hope that the new Landsat instrument will allow us, for the first time, to accurately map and monitor water quality conditions in the complex waters found in the coastal and fresh water environment,” says Schott, the Frederick and Anna B. Wiedman Professor in Imaging Science in RIT’s Chester F. Carlson Center for Imaging Science. A succession of Landsat satellites has orbited the Earth’s poles since 1972. Each one has passed over the same spot every 16 days to construct cloud-free composite images used to detect and monitor global changes to the landscape. Schott’s history with the program began in 1981, with a grant from NASA to work on Landsat 4. It was RIT's first major research grant and laid the cornerstone for the university’s imaging science program.